I always find it interesting to see how the same character is interpreted by different people. Considering the fact that multiple mini figure lines are based on well-known mythological creatures they often share the same characters, which allows for some good comparison. Medusa has always been one of my favorite monsters, so I thought it would be cool to get a shot of different interpretations of her from three mini figure lines: Monster in My Pocket, Diener mythological monsters and Necro's Fortress. 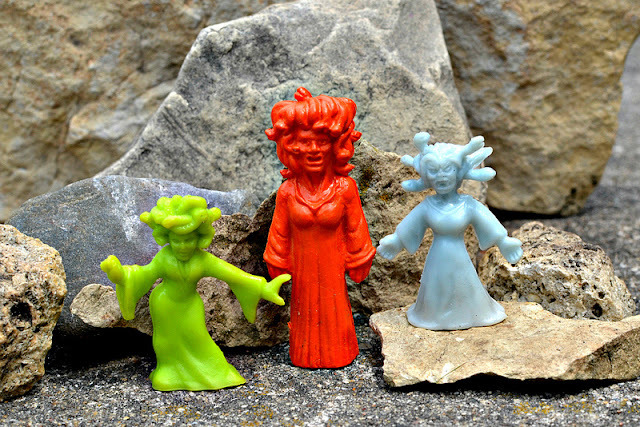 They're all technically Medusa figures, but in the photo you could also think of them as the three Gorgon sisters from Greek mythology: Medusa, Stheno and Euryale. Which figure do you like best?